If you suffer from teeth grinding in Medford, investing in a customized night-guard can help to protect your smile from the harmful effects of the habit — like chipped teeth, a sore jaw, and the general wear and tear of the smile. A night-guard cushions the tooth enamel and may even help to reduce the instance of teeth grinding and jaw clenching. 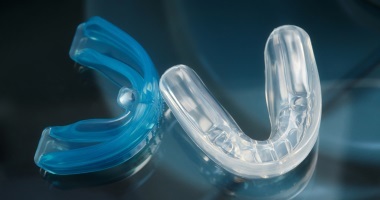 Dr. Gary Rosenfeld provides custom-fitted night-guards for patients suffering from bruxism. Bruxism affects from 10 to 15% of the adult population. While it is less common in children, young patients may also grind their teeth or clench their jaws. Many people who suffer from bruxism don’t realize they have an issue because it usually occurs during sleep, or in that hazy period between wakefulness and rest. Sometimes a partner sleeping nearby can help to identify nighttime teeth grinding. What Causes Nighttime Teeth Grinding? A number of factors may cause people to grind their teeth or clench their jaws. The first is stress, which is why the condition is so common in adults. A misaligned bite can also cause bruxism. Excessive caffeine consumption and medications for depression or attention disorders can also cause jaw clenching. Talk to your doctor about your full health history, including any medications that you are taking. One very effective method for treating bruxism is with a night-guard that is customized to fit your specific teeth. You can find one-size-fits-all options at the grocery store, which you boil and then bite into to create a mold of your teeth. These methods are not as effective as a customized solution, however. A night-guard that is created specifically for your smile is higher quality and is created of high-quality plastic in our partner dental laboratory. A custom-fitted mouth-guard is usually far more comfortable, increasing the chances that you will use it as recommended for maximum protection against the harmful side effects of teeth grinding. The night-guard protects your tooth enamel and takes pressure of your jaw muscle to prevent pain in the TMJ, or temporomandibular joint, which is closely linked to nighttime teeth grinding. In addition to seeking professional treatment for nighttime teeth grinding and jaw clenching, it is a good idea to try to naturally reduce the occurrence of bruxism. The habit is often caused by stress, so patients may want to consider stress-reduction activities like meditation, vigorous exercise, reducing caffeine and alcohol intake, and other healthy lifestyle habits. Are you dealing with the harmful effects of nighttime teeth grinding? If so, don’t wait to seek treatment with a custom-fitted mouth-guard from Dr. Gary Rosenfeld. We can protect your smile from the damaging side effects of bruxism! Schedule an appointment today.